I'm so used to taking pictures of everything these days that I do it automatically, even when I don't think I'll use the photos. And really, haven't you seen enough death anniversary dinner pictures? In case you missed it, my post about ancestor worship and death anniversary traditions. Then I realized that banh khot (Vietnamese savory mini pancakes) was a new addition to my family's usual banquet spread. Since this follows my recent 100 Vietnamese Foods to Try list, I figured I'd go over some of the foods. Store-bought roast duck, #44. Cha Gio (Vietnamese Spring/Egg Rolls), and #81. Nem Nuong (Vietnamese Grilled Pork Patties) both made by my oldest uncle's wife. Tom Rang Muoi (Vietnamese Shrimp Fried with Salt) made by my youngest aunt's husband, store-bought steamed chicken, and #10. Banh It La Gai (Nettle Leaf Dumplings) made by my oldest uncle's wife. Crab, shiitake mushroom, and fish maw egg drop soup by my youngest aunt, I think banh ba trang (the Vietnamese pronunciation and spelling of Chinese bak chang (meat dumplings)), #9. Banh It Tran (Round Rice Dumplings with Pork, Shrimp, and Mung Beans) by my oldest uncle's wife, and scallop fritters by my youngest aunt's husband. 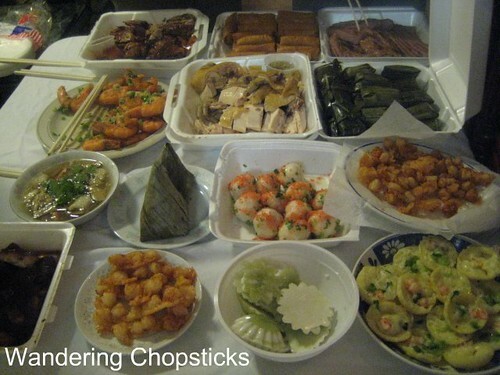 Store-bought Xa Xiu (Chinese Barbecued Pork), scallop fritters again, Vietnamese coconut jelly, and #11. Banh Khot (Mini Savory Pancakes) by my youngest aunt. So how many of the 100 Vietnamese Foods to Try have you checked off? 1 year ago today, 7 of 7 random things about me meme: I hate the word "foodie." Now I know where you got your creativity and love of food from. Your whole family cooks! Is the coconut jelly made with gelatin or agar? I heard the owner of the store near us giving a recipe to customer for pandan jelly and she said to use agar, not gelatin. Any chance we could get the recipe for the coconut jelly - sounds yummy yo me. I will have to go back and read your post about ancestor worship and death anniversaries. I'm not familiar with those concepts. How great that each of your family members has a special dish to contribute. Everything looks scrumptious and inspires me to get busy on that 100 list. Oh, that's good to know. The last time I posted about death anniversaries, a lot of people didn't know what I was talking about. Wish you were here to eat it! It's made with agar. I don't have a recipe. Not sure which auntie made it actually. I don't know who made them, but I assumed youngest aunt or her hubby? This was the first time I saw them!